Brand new modern town home with spectacular views in the heart of Troutdale. A perfect retreat while attending a wedding, concert or enjoying all that the Columbia River Gorge has to offer. The town home has 2 bedrooms 2.5 bathrooms and a den located just one mile from Edgefield, three miles from The Riverview Event Space and across the street from The Troutdale House. Brand new! 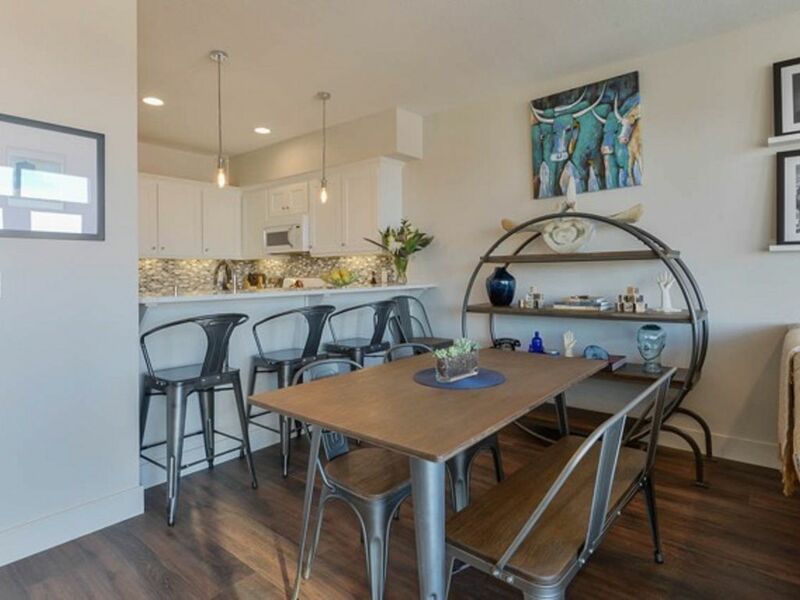 Bright and light filled open concept town home in Troutdale center. And you don't have to bring your knife from home! Master bedroom has vaulted ceilings with sweeping views. Master bathroom has double sinks and a stand up shower. 2nd bedroom is cozy and comfortable. Queen Beautyrest luxury plush mattress. Guest bathroom that is bright and clean. Fantastic place in every way!!! From the beautiful artwork to the treats in the fridge, this is by far the best VRBO that we’ve ever been in! Thank you Becky! This place is amazing! We have stayed at a many VRBO's throughout the US and Europe and this one is by far tops on our list. Before booking a place I always read through the reviews, contact the owner and look at the photos. The photos and reviews are spot on. The place is super clean (bonus plus)! We arrived to find fresh flowers throughout, the extra bed set up, yogurts, muffins, milk, coffee beans, juice, fruit, local cheese, eggs, some snacks and even a bottle of bubbly! The beds were super comfortable, great bedding and towels that made you feel pampered. The baths had plenty of nice toiletries available to use as well as hairdryers in each. Loved sitting on the patio outside the master suite and the main room! The view from either balcony is beautiful, especially at sunset. Although we didn't "cook" anything, we certainly could have as the kitchen was well equipped with cookware, utensils, spices, oils and even maple syrup and waffle mix! The rental had beach towels, chairs, and coolers available and was close to the local swimming hole. The attention to detail was extraordinary! Both my daughter and I agreed that we could easily live here and be very happy! Although Troutdale is a 15-20 minute drive to parts of Portland, it was a great spot to be as we traveled throughout the area taking in the Columbia Gorge, Mt. Hood, and Portland. This place is a definite 5 star listing! Would stay here again without any hesitations! Thank you Becky!! This property was perfect! Great location, clean, beautifully decorated with wonderful natural light and outstanding sunset views. Our hosts provided us with yogurt, granola, coffee, muffins, chips and salsa as well as a bottle of wine. Our greatest compliment is that we may borrow some of their building ideas in our next project. We thoroughly enjoyed our stay in this lovely and comfortable space. Everything about the layout is aesthetically pleasing and the attention to detail is impressive. The location makes for excellent access to both Portland and the Gorge, and the view is as excellent as advertised. We found Becky to be a generous and accommodating host; the kitchen was well-stocked with top-quality utensils and tableware, and Becky thoughtfully provided breakfast and beverage options beyond what we have expreienced in any other rental. Our overall experience was definitely one of our best in 30 years of travel. This was an awesome stay! The owner is so great and full of helpful information. She kept in contact with us throughout our planning and gave us lots of ideas of things to do and see. Really enjoyed our stay and would definitely stay here again if we ever are back in the area. Thank you so much! This place has it all! I’ve stayed in many VRBO homes and this in the tops. Everything you need and personal touches for you await. Thank you Becky!